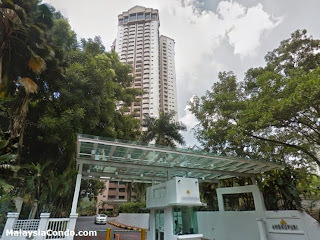 Angkupuri is a 39 level condominium, located at 20 Jalan 1/70 C off Jalan Bukit Kiara, 50480 Kuala Lumpur. Angkupuri is about 8 kilometers from Kuala Lumpur City. It is sitting on a freehold land and surrounded by prestigious residential neighbourhoods such as Sri Hartamas, Damansara Heights and Bangsar. Other notable developments in the immediate precinct of the neighbourhood include Garden International school, Mont Kiara International school, Kuala Lumpur Golf and Country Club and Bukit Kiara Equestrian and Country Resort, making it a highly sort after condominium. This low-density condominium comprises 210 units and it offers facilities such as Tennis courts, Resort standard swimming pool, Putting green, Lanscape garden with fountain, playground, jogging track and barbecue facilities, Function room, Childen's nursery, Ample car park bays, Mini mart, 24 hour security, Gymnasium, Squash. With just two units on each floor wing and each unit is a corner unit; you can enjoy excellent 180° views of the surrounding scenery. There are three types of unit on each floor: Type A with 1249 sq. ft build up; Type B with 1399 sq. ft and Type C with 1550 sq. ft. There are four units of penthouses which are divided into 1 unit of Type A penthouse with 2458 sq ft; 2 units of Type B Penthouse with 2798 sq ft and 1 unit of Type C penthouse with 3100 sq ft.
Built-up Area : 1,249 sq.ft. - 3,100 sq.ft.